So today I decided to finish up the Lonely Lisa doll I started fixing this week. I am cringing a little as I think about the following pictures coming your way. Don’t judge me! 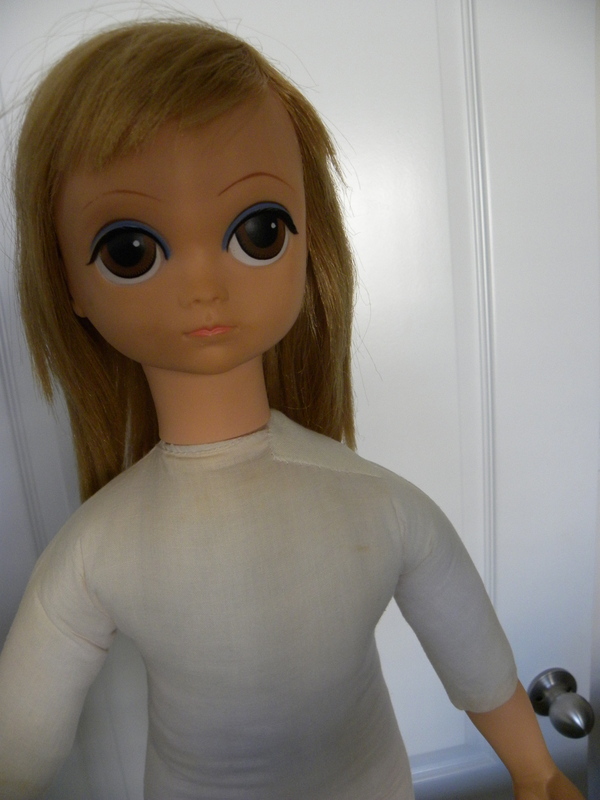 She’s still a pretty thing, she’s just far from perfect…..Remember, I rescued her from the landfill….. 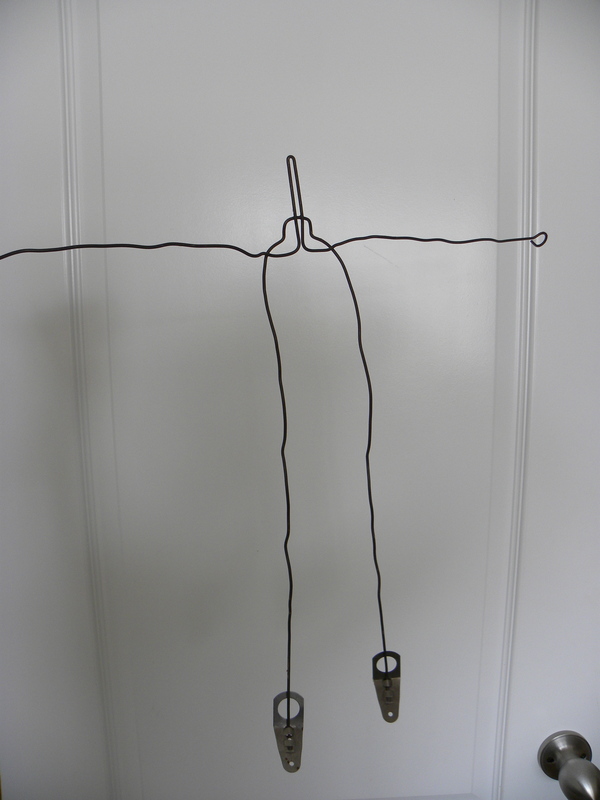 So I started out by straightening out her original armature. 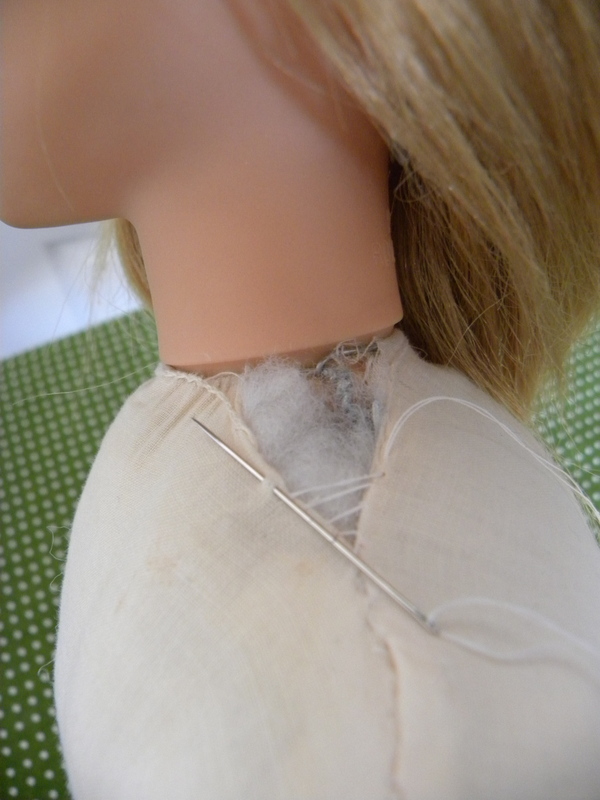 I wrapped a little stuffing around her legs before inserting them into her cloth body. Wrapping some fiberfill around each leg wire (only showing one leg here) This will compact pretty quickly inside the leg. Now the legs go in the body. So far, so good. Legs in all the way. 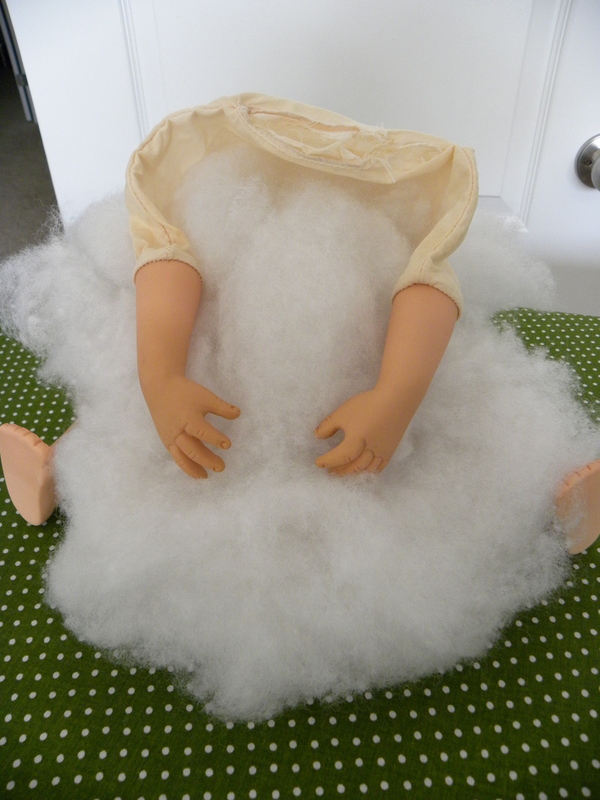 Now it’s time to add a little more stuffing and slide the arms into place….. Okay. 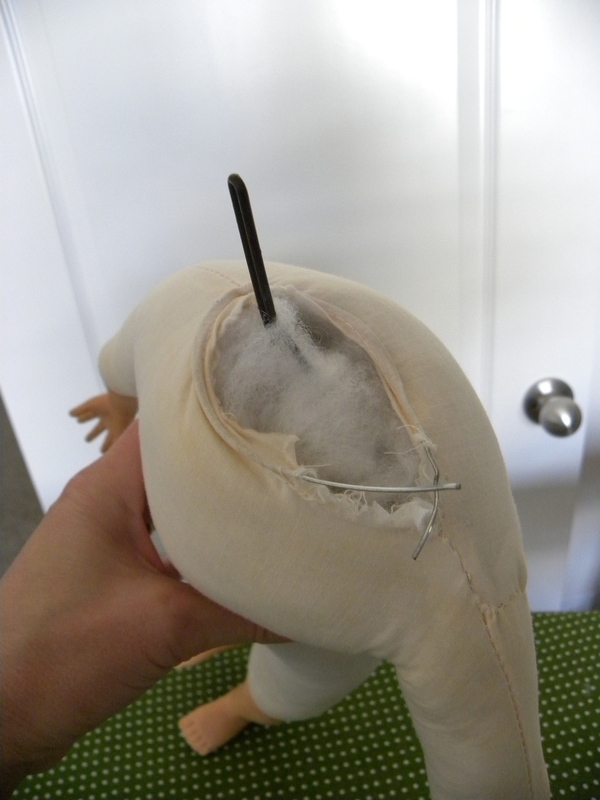 The armature should have gone in completely before any stuffing happened. But that’s not what I did. I kept stuffing until there was the sound of ripping fabric. It isn’t supposed to be like that! Lisa is a vintage girl. She’ll be 50 next year. And that fabric is not so strong anymore. So now I get the bright idea that I’ll just do a reverse patch. I’ll have a piece of fabric on the inside, hidden from view, and I’ll stitch through the new fabric as I stitch through the old. 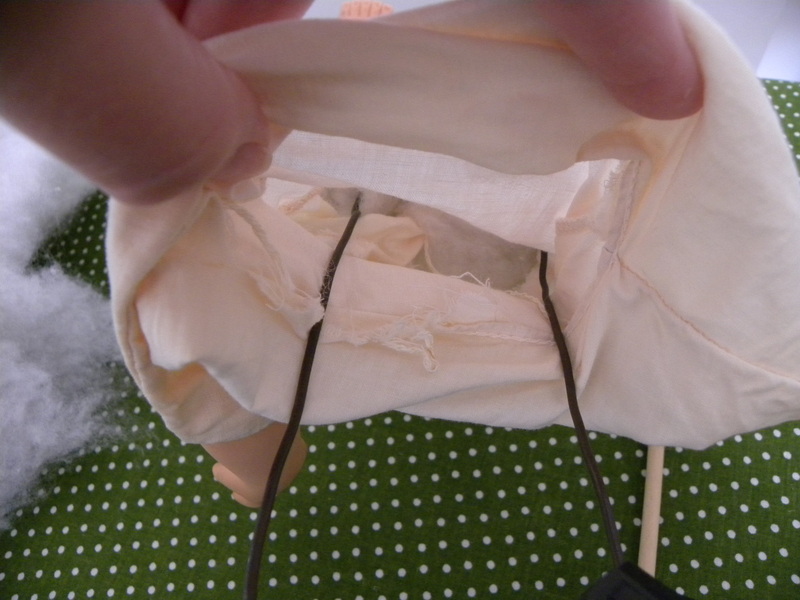 The new material will keep the old fabric from tearing more…. Feeling clever now…..But this is where I should have stepped away from the project. 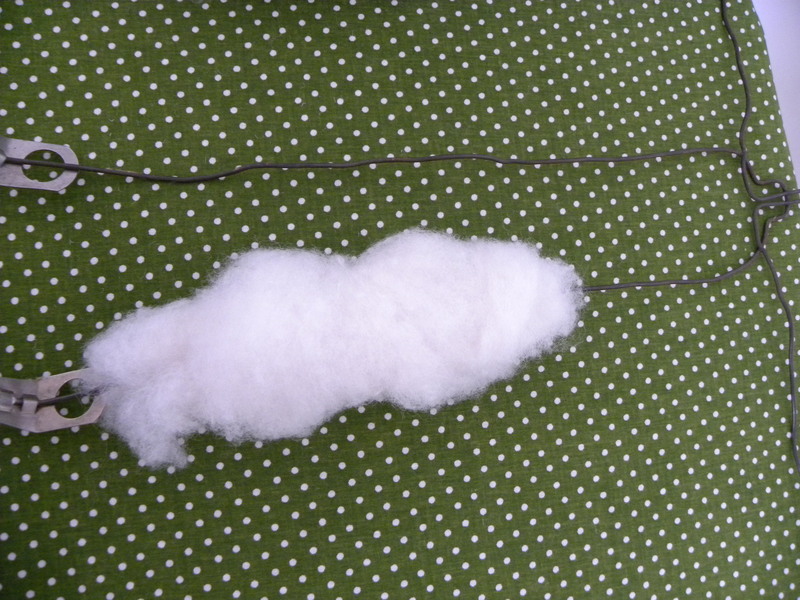 Now a new wire is run through the thin casing around the neck. That neck opening looks pretty ratty. Hmmmm. 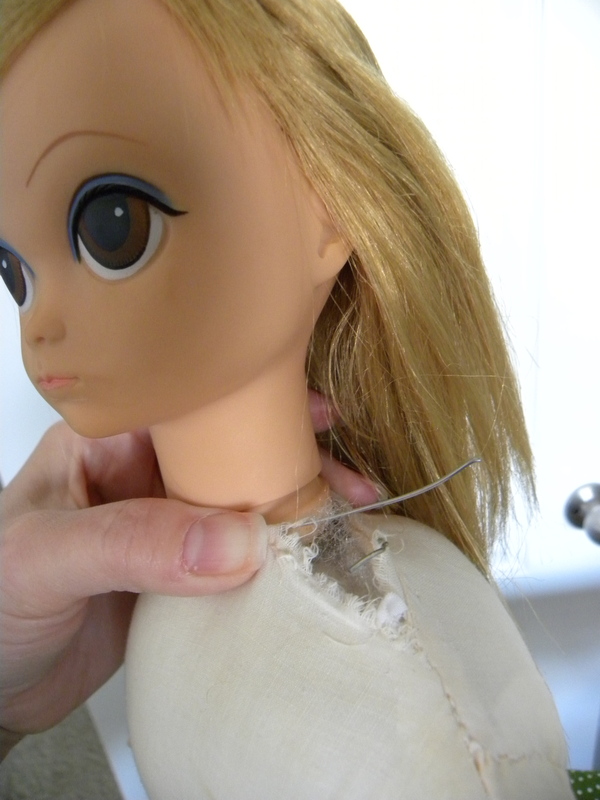 Notice that there is a bit of a gap there in her shoulder seam? Nope, this is not going to work. More patch working here. And a little patch on the outside as well, just to keep things really secure. So this is what happened. She now has a patch at her neck. It’s neat. And you’ll never see it under her clothes. But it’s a patch. Yuck. « A gift from a dear friend…. Don’t be too hard on yourself! The patch isn’t that bad. 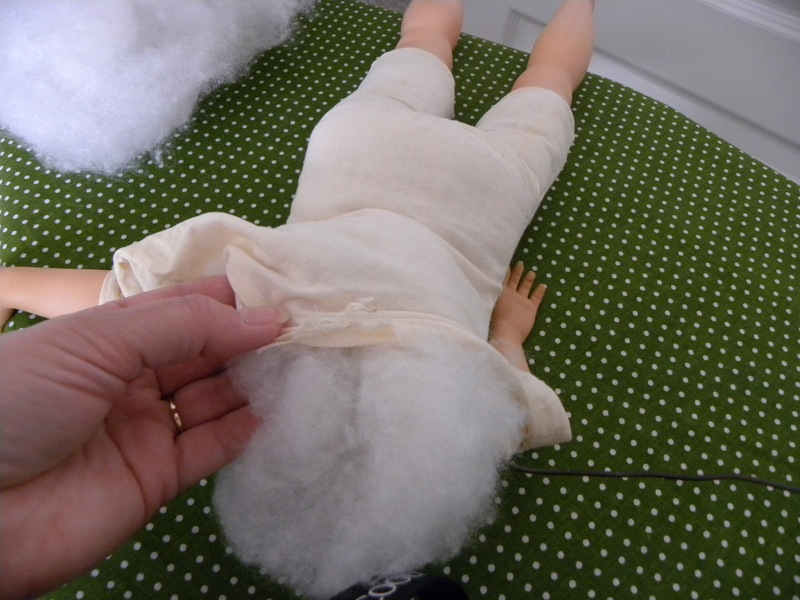 I know all too well how tiring it can be to work on a doll and want her finished, and then something goes wrong. I would have done the same thing. You can always make her a new body later. In any case, she is in much better condition than she was. Fresh & clean and lovable! Hi, I was lucky enough to purchase, for a very minimal price, one of these Lonesome Lisa dolls. 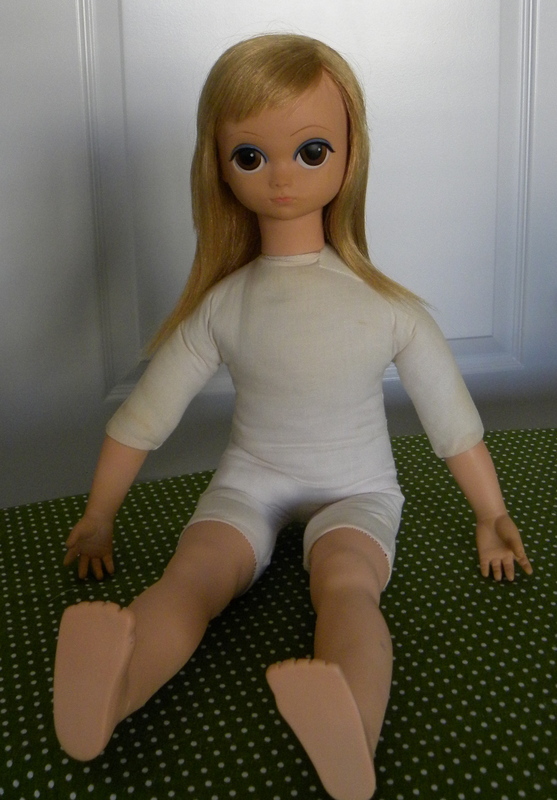 I feel very fortunate that she had her original dress, in excellent condition, and also that when I re-stuffed her, I left as much of her in-tact as possible. 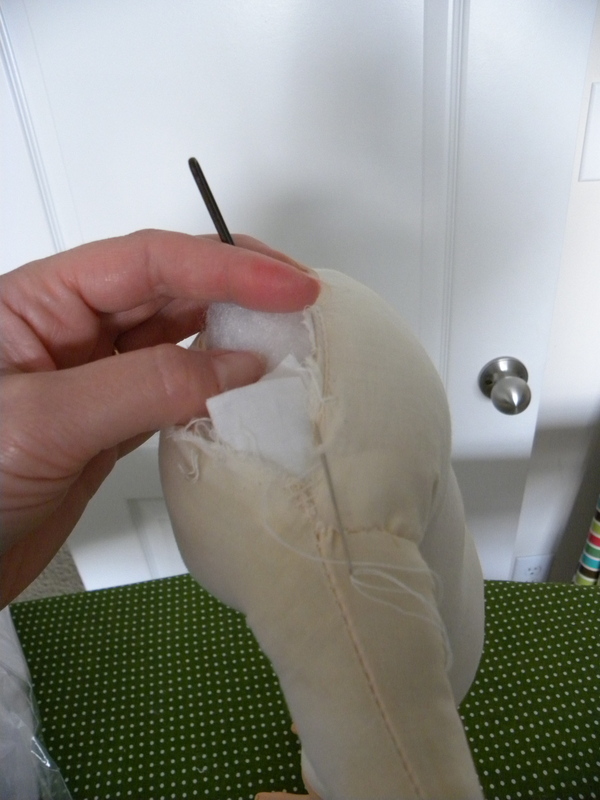 I only opened the back stitching, which runs horizontally across the rear end. I was able to gently empty out the disintegrated, foam stuffing and then cautiously washed her in a cold bath of sudsy laundry soap. 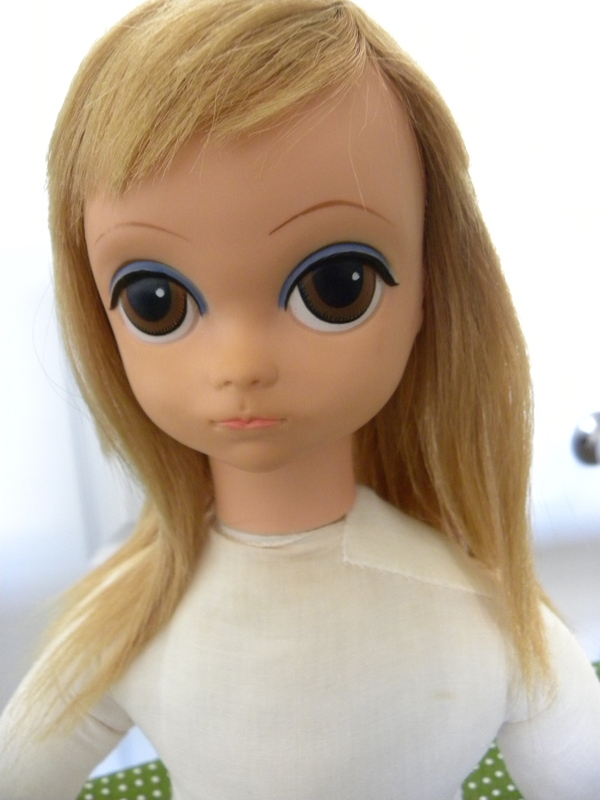 After rinsing all soap out and hanging to dry by her shoulders on the clothes line, I was ready to re-stuff her. 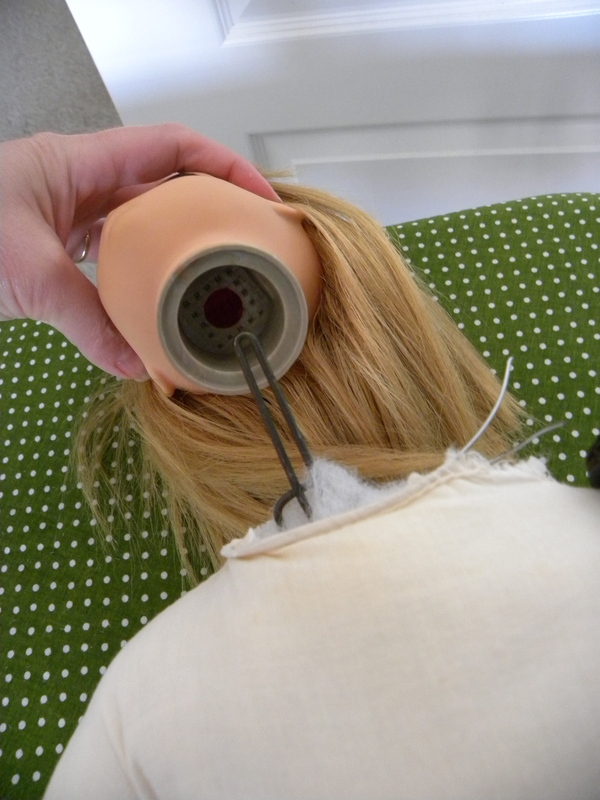 This I did while leaving her armature in place, and only re-fitted it into her head, etc. 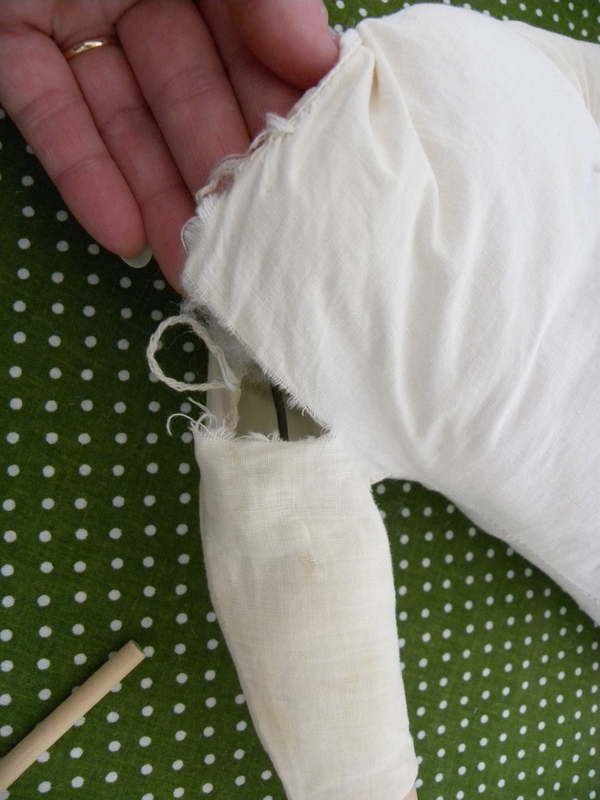 Then she was stuffed with poly-cotton blend quilt batting cut into rectangular pieces, and gently pushed in firmly with a wooden dowel. I re-stitched the one seam, and wha-la! She was done! This worked beautifully, thank goodness!